Jim Siedow received his B.A. from the University of Texas at Austin in 1969 and completed his Ph.D. in Plant Biochemistry from Indiana University in 1972. He did postdoctoral research at the University of Michigan and Rice University before joining the Duke faculty as an Assistant Professor of Botany in 1976. He became a Full Professor of Botany in 1987 and a Professor of Biology in 2000. 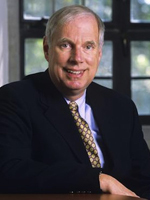 He became Vice Provost for Research in January, 2001.